This is a really quite exciting discovery for me, I have seen this brand name before it is especially popular on Facebook and YouTube where there is a massive army of dedicated fans, and I am beginning to learn why ! Look Fabulous Forever is the brain Child of Founder and CEO Tricia Cusden who won't mind me saying is one of us "mature" ladies, as such she wanted a makeup range specifically designed to flatter and enhance mature skin as our makeup needs change. The beauty of LFF is that it is specifically tailored to flatter your personal colouring and skin tone, when you look at the site you are guided though what will suit you as though you have a beauty expert holding your hand. I discovered with the help of the site that I am warm toned so the products I will show you here may be different shades to what will suit you, but it will give you the idea.. Your blank canvas starts with your base so that's where we will start . The shade I have here is 02 This foundation base is rich and creamy with a beautiful "feel " to it. On first impression I thought it was going to be too dry for me and give me that flat matte looking base, which I hate, but no, it applied really well with a beauty blender and brush, I did try fingers but it's not my favoured method, although it works equally well, once applied the base gives your skin an almost luminous finish, not dry, but not greasy, more of a soft dew. It actually looked better after a few minutes warming on the skin, the final look was incredibly flattering with nothing sinking in or highlighting lines. The base lasted literally well into the evening without any transfer or patchiness, there was honestly no touch up needed and you could go straight from a day out into the evening without any problem. I don't know about you, but I have had the fear as I have got older that eye makeup can sometimes be ageing, starting off looking great and within a couple of hours clinging to every line and wrinkle it can find ! ( very attractive ) I do wear a primer when applying any shadow and this one from LFF I found especially good as not only is it easy to apply the consistency is smooth and it has a skin tone neutral shade, so any darkness instantly disappears, you are left with smooth primed lids ready to play ! These little mini compacts of eye shadow are the perfect size for your makeup bag. Complete with their own mirror, the powders are a creamy soft texture, (in fact I had to double dip to check that they were actually powder ! ) that apply easily in a really subtle way. The lasting power is outstanding coupled with the eye prime. I really like these individual pans as with most shadow palettes you only end up using half the shades, this way you are not wasting money by buying colours that you wont wear. There are 9 shades to choose from, shown here are Taupe & Cream. I am head over heels for this product, it's a creamy shadow that applies like a dream , giving the most beautiful glow to your lids, you can either be really subtle with this shadow or bling it up for a more glam evening look, it holds well, never creases, and is honestly one of the loveliest shades I have used this year. there are 3 gorgeous shades available, the one shown here is Golden Mist. This mascara has the ideal length wand for easy control, it will lift and separate lashes without causing clumping or spider legs - we all know about that look ! The lashes are left soft and pliable. Easy to remove with any makeup remover as it is non waterproof, there is however a waterproof version available should you prefer. Another thing that has really impressed me is the shelf life of these products, there is a huge awareness of late as to the dangers of using out of date makeup, we have all done it, hung on to that favourite lipstick or eyeshadow without ever checking the use by dates ! Look Fabulous Forever have really good shelf lives, the base is 24 months, eye shadows 36 months, eye prime 24 months, and mascara 24 months, I think it is especially important with eye products, as the last thing you want is a nasty infection from old products ! 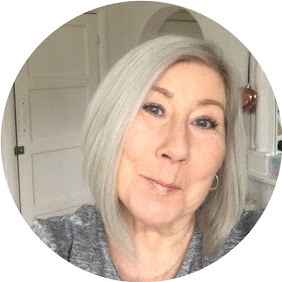 Overall I am thrilled to have discovered this brand flying the flag for mature girls, it's very easy to become invisible after a certain age, Tricia Cusden is here to hold your hand throughout the whole makeup choosing process. Post has been written in collaboration with Look Fabulous Forever, all opinions are my own.